Check out some of the Fantastic fish we have been catching! Want to Win a Free Fishing Trip? 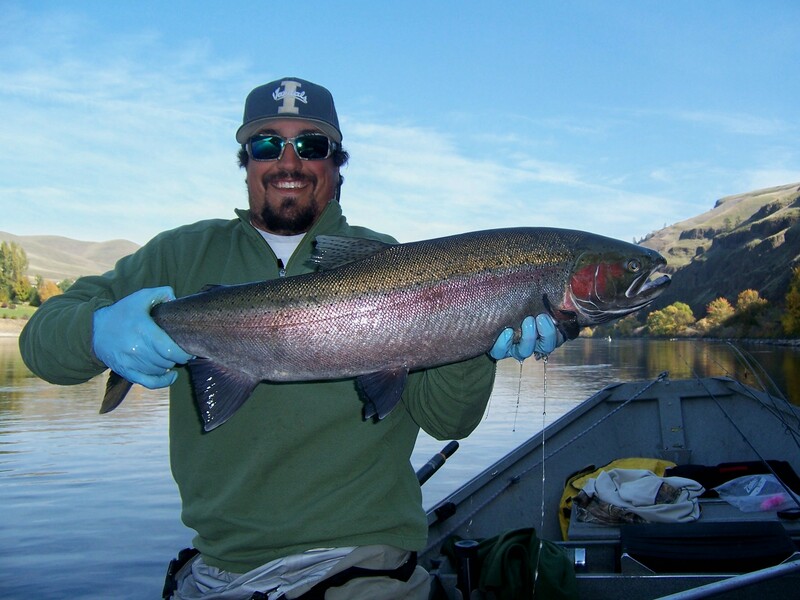 We fish for Salmon and Steelhead throughout the Columbia and Snake River System. On the Columbia River we fish Astoria, Portland, Columbia Gorge, John Day Dam, McNary Dam, The Hanford Reach, Wanupam Dam, Wells Dam, and Brewster. On the Snake River we fish Little Goose Dam, Lower Granite Dam, Clarkston, and Heller Bar. We fish the Columbia River for some of the finest Walleye Fishing in the World. Many belive the next world record walleye will come from the Columbia River. 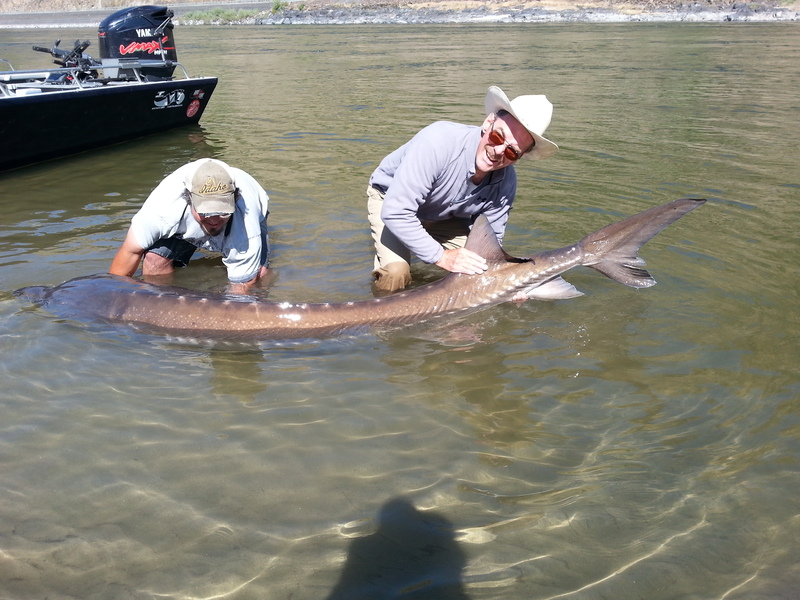 The Columbia is also know for astonishing catches of great eating sized fish! Best Trout Fishing of the year! American Falls Trout Fishing is on Fire! 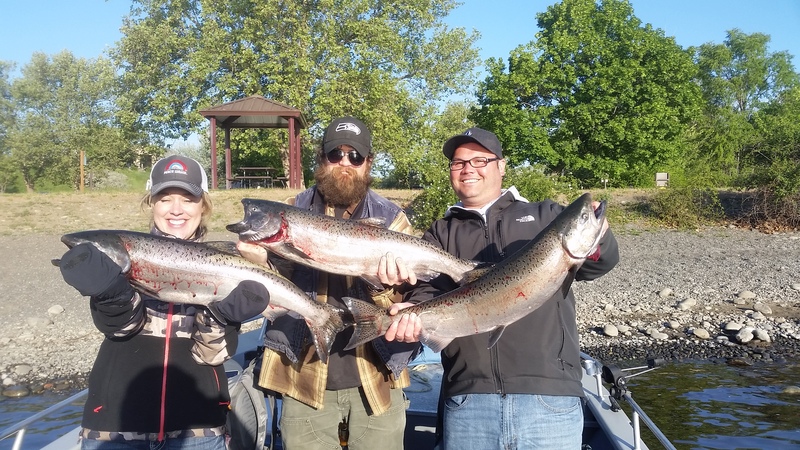 Hanford Reach Continues to fish Great! We are just absolutely in love with these awesome fall Chinook from the Hanford Reach! We will be here through the 15th of October! We have open boats! Fishing has continued to be very good down here in the Astoria, Oregon area of the Columbia River near Buoy 10. We have been putting limits of salmon on the boat for our customers daily. We had a fast and furious morning of salmon fishing on the Columbia River out of Astoria, Oregon. We still have some openings next week. Give our office a call at 208-669-1569 or Book Online Now. We had a great day down here fishing in Astoria Oregon on the Columbia River. We had a boat limit of Chinook and had a bunch of other chances. We still have a few open seats so give our office a call or Book Online Here! Astoria / Buoy 10 Fishing Report! The Columbia River Sockeye action continues to be very good in the Brewster Pool of the Columbia River. We managed to get a quick limit again today out of the Brewster Pool. This fishery will last as long as the weather stays warm! Brewster Sockeye Fishing is Hot! Today was good again for both Chinook and Sockeye in the Brewster area of the Upper Columbia River. Great numbers of Sockeye are still available! Book your date with us today. 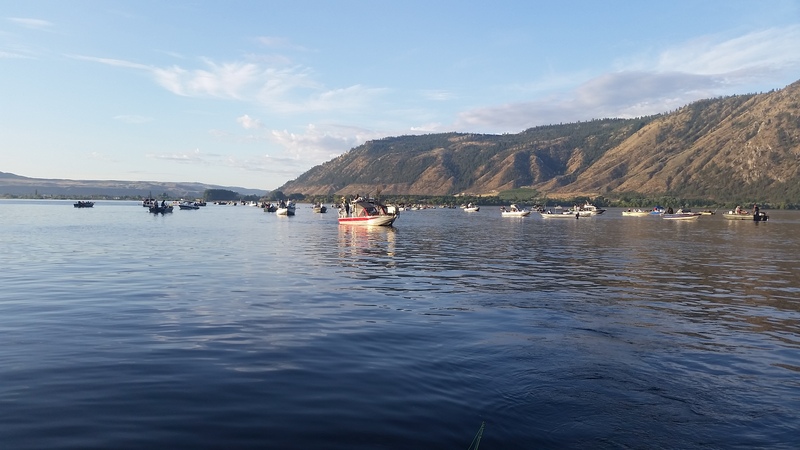 Upper Columbia River Sockeye and Chinook Report. Fishing has continued to be good for both Sockeye and Chinook the past few days! Rumor has it that we might be getting an increase in our Sockeye limit. These are amazing fish on the table! Had a great day today on the Clearwater River working for Reel Time Fishing! It’s looking like at least the upper river will be open this next week. Kyle has open boats the 14th, 15th, and 16th this week. Give us a call at 208-669-1569 and let’s get your trip set up. We have been finding a few fish the past few days. Fishing was a little tougher yesterday and today, but we still had plenty of chances and put 3 in the boat each day. All our fish have been coming on pro troll flashers and brads superbaits. We had a fantastic day today at Drano as we filled the boat with 8 nice Chinook. We still have open dates the 21st and 22nd of May before we head home to Idaho to fish the Clearwater. We had another good day of Walleye action on the Columbia river today. We had two customers put a total of 15 Walleye and a few bass in the boat! We have openings for Walleye fishing on the Columbia through June. Columbia River Walleye Fishing is Heating Up! We continue to see some fantastic fishing for Columbia River Walleye. Yesterday we found most of our fish in just a few locations and concentrating on short trolls where were were getting bites was our key to success. Our fish over the past few days have been spitting up quite a few juvenile pacific lamprey. The Walleye bite on the Columbia River is heating up! We had a great day today mostly jigging, but we also caught fish in worm spinners with bottom walkers. We have openings now through June for the best tasting white flesh fish that swim. Idaho’s Clearwater is Fishing Great! 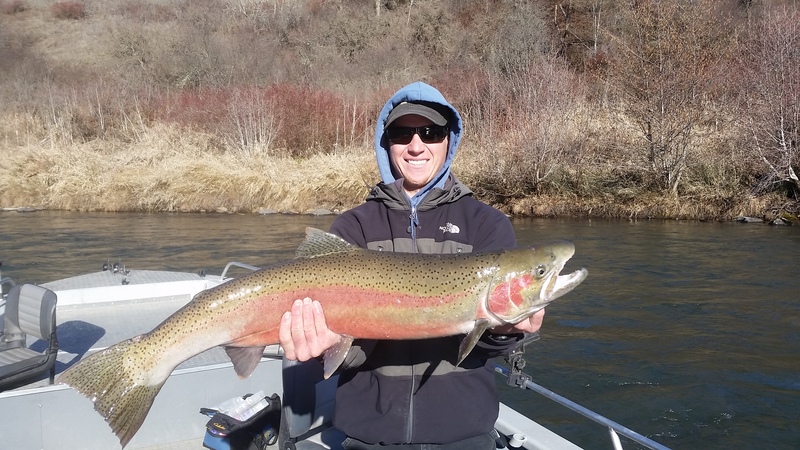 Idaho’s Clearwater River is Fishing great! We love it when a good plan comes together. Fished some water we have spent a lot of years in today and did very well! 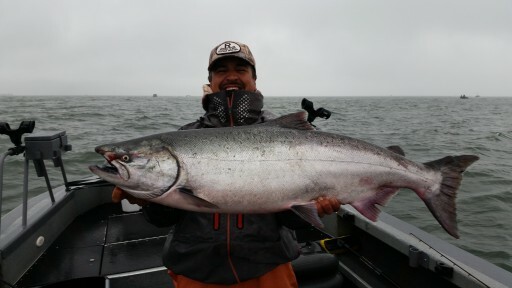 We still have some openings for this great Chinook Salmon Fishing on the Hanford Reach. We have a full boat open the 12th, 15th, 16th, 17th, 18th and 19th. Chinook Fishing out of Astoria is on Fire! 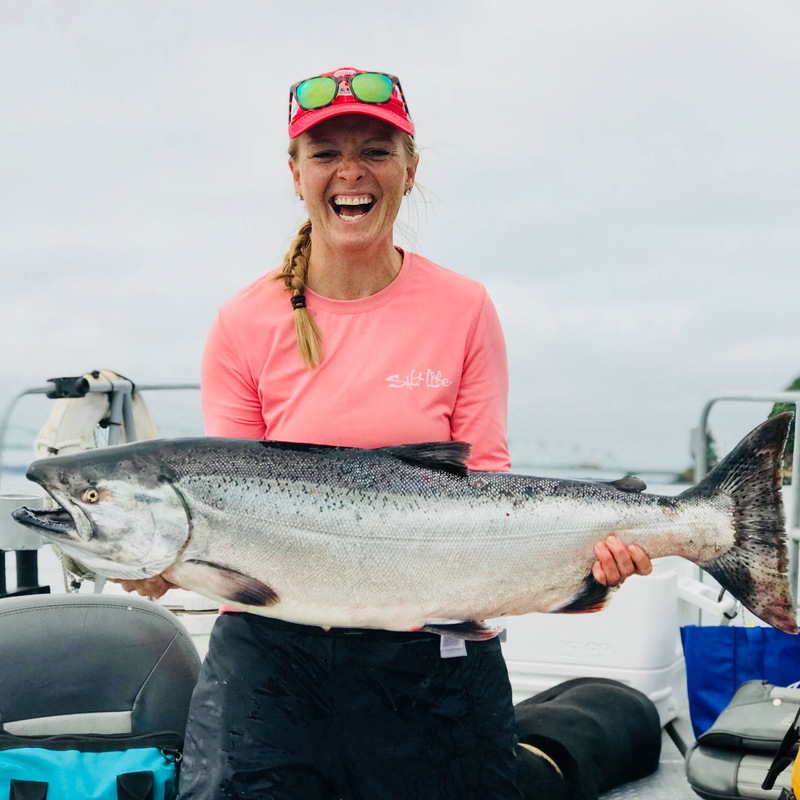 Chinook Fishing is Great in Astoria / Buoy 10! Astoria/Buoy 10 fishing is on fire! Columbia River Walleye and Clearwater Spring Chinook! Hot Action at Drano Lake! We had a fantastic day today Walleye Fishing on the Columbia River. We boated a total of 76 Walleye for 3 people. I have openings Sunday and through next week for this fantastic fishing! Fishing has been fantastic on Idaho’s Clearwater River. We have been averaging 8-15 fish per day. Today we ended up with 15 big Steelhead to the net. Check out the video below for some of our footage from today. All Clearwater trips are done as employees of Reel Time Fishing. We have openings next week. This past week we had a few days of really great fishing and a few days we struggled. The weather this past week was particularly brutal and the days we struggled we were ultimately just fighting the cold and wind. Most of our fish this week were caught side drifting cured eggs and pegged corkies. Buoy 10 / Astoria Fishing Report. Fishing is really starting to pick up down here in the Portland area for Spring Chinook. A fellow guide buddy and I snuck out for a little fun fishing this morning and we’re handsomely rewarded with a quick limit of Columbia River Spring Chinook. We picked both these fish up trolling flashers and herring downstream. Brewster Pool Sockeye is on Fire!! !